If you've been drinking Becks in America, then you have been deceived. But thanks to a lawsuit, you can get some beer money back. If you've been drinking Beck's in America, you've been punked for thinking your brew is from Bremen. Beck's is made in America, just like Bud. In fact, they're crafted in the same breweries. 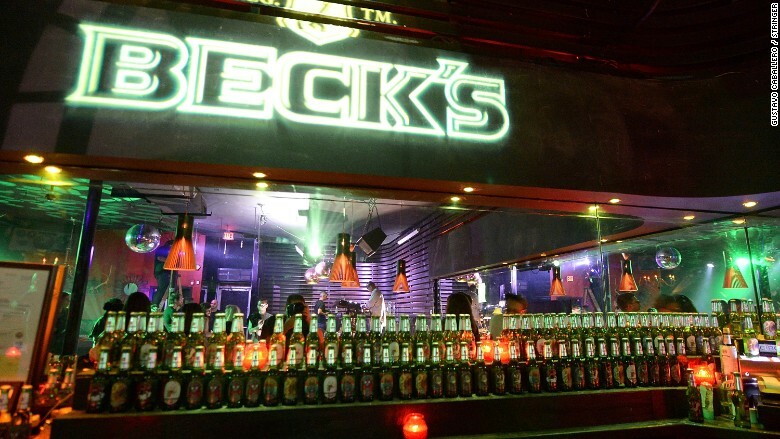 But thanks to the settlement of a class action suit filed in U.S. district court in Miami guzzlers of Beck's will be getting some of their beer money back. The deal entitles Beck's drinkers to a refund of up to $50. But that's only if they kept their proof of purchase. Beck's drinkers who haven't been hoarding receipts will have their refunds capped at $12. The settlement says that every six-pack is worth 50 cents in compensation, or $1 for a 12-pack. The lawyers who filed the suit have something to really toast about - they get $3.5 million. The original lawsuit charged that Beck's, which is owned by Anheuser-Busch InBev (AHBIF), "has committed unfair and deceptive practices and has been unjustly enriched by marketing and selling beer in a way that misleads consumers into believing that Beck's Beer is German, still imported from Germany, claiming that Beck's Beer 'originated in Germany' with 'German quality' while 'brewed under the German Purity Law of 1516.'" The suit was filed by three Beck's beer drinkers, including one who bought "approximately" one six-pack or 12-pack of Beck's per week for the last eight to 10 years. They did not keep their receipts. A spokeswoman for the lawyers filing suit said, "The settlement is structured to provide relief to consumers regardless of whether they kept receipts, while at the same time setting caps to guard against the potential of inflated claims." The lawsuit points out that the Beck's company was formed in Germany in 1873 and was controlled by German families for more than a century. But in 2002, Beck's was sold to the Belgian company Interbrew, which merged two years later with AmBev, becoming InBev. In 2008, InBev bought Anheuser Busch for $52 billion, becoming Anheuser Busch InBev, and gaining control of 13 breweries in the U.S.
Related: Bud mocks craft beer. But it owns microbrews! The lawsuit said that Beck's moved beer production from Bremen to St. Louis in 2012 to save $9 million in annual transportation costs. "Beck's is brewed with water from Missouri, as opposed to the Rotenburger Rinne in Germany," said the suit, which also noted the logos on the label still display the coat of arms of Bremen, while the fine print on individual bottles and cans says that it's a "Product of USA."